Ivysaur is a Grass/Poison-type Pokémon from the Pokémon series, appearing in Super Smash Bros. Brawl and Super Smash Bros. Ultimate as a playable character. In the Pokémon series, it is the evolutionary form of Bulbasaur and evolves into Venusaur. 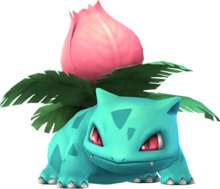 In the Super Smash Bros. series starting with Super Smash Bros. Brawl, Ivysaur appears as one of Pokémon Trainer's three Pokémon along with Squirtle and Charizard. Its standard special move is Bullet Seed, which involves it shooting seeds directly upward, its up special is Vine Whip, which has it attack with a vine that strikes upward, and its side special is Razor Leaf, which involves it throwing it a grass projectile forward. Its down special is Pokémon Change, in which the Pokémon Trainer returns Ivysaur and sends out Charizard, or sends it out if Squirtle is the active Pokémon. For the group's collective Final Smash, Triple Finish, Ivysaur attacks with SolarBeam. Ivysaur has a certain amount of stamina, which decreases as he remains on the battlefield and weakens its attacking power. 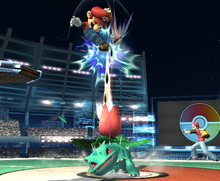 Ivysaur also has an extended grab in the form of two vines, but unlike other characters it does not function as a tether recovery; this is instead given to Vine Whip. In addition, Ivysaur, like in the Pokémon games, takes less damage from water attacks but takes more from fire attacks. Ivysaur is found during the Subspace Emissary part of the game as a trophy sitting inside a cave before Pokémon Trainer battles Charizard. Pokémon Trainer throws a Poké Ball at it and it is caught. After that Ivysaur can be used during the campaign. Ivysaur is voiced by Craig Blair, who previously voiced it in the Generation I-V Pokémon anime. The concept of switching between Pokémon is omitted from Super Smash Bros. for Nintendo 3DS / Wii U, causing Charizard to return as a standalone fighter, while Pokémon Trainer, Squirtle, and Ivysaur are not playable. Ivysaur, does however, appear as a trophy alongside Squirtle and Pokémon Trainer. Ivysaur reappears in Super Smash Bros. Ultimate as a playable character, alongside Pokémon Trainer and Squirtle. Ivysaur's design is updated to reflect its current appearance, while it is now voiced by Justin Alsemi, who has voiced it since Pokémon X and Y. Ivysaur's standard attack has a finisher in the form of a double vine slap, while his down tilt now only hits once. Additionally, some of his attacks have more range. Bullet Seed is a Grass-type attack in the Pokémon series, and Ivysaur's standard special move. When used, Ivysaur launches a continuous stream of seeds into the air from the bulb on its back for a limited time or until the player releases the special attack button. Any nearby opponents when the move is first initiated are also hit by Ivysaur and launched into the path of the seeds. In Super Smash Bros. Ultimate, Bullet Seed now receives a finishing hit, enabling it to KO easily. Razor Leaf is a recurring Grass-type attack from the Pokémon series that appears as Ivysaur's side special move. Ivysaur throws the projectile with two vines, sending it across the stage to attack before it disappears. The leaf can curve in a random direction at the end of its path. It can also be thrown faster by holding the special attack button when executing the move, but the leaf curves at a wider arc as a result. 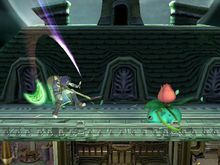 In addition to Ivysaur, other, non-playable Pokémon are able to use Razor Leaf in the Super Smash Bros. series. In Super Smash Bros. and Super Smash Bros. Ultimate, Razor Leaf is used by Venusaur when it appears out of the building on Saffron City. It is also used by the Poké Ball Pokémon Chikorita in Super Smash Bros. Melee and Super Smash Bros. Brawl and Snivy in Super Smash Bros. for Nintendo 3DS / Wii U.
Vine Whip is Ivysaur's up special move, based on the Grass-type move from the Pokémon series. Ivysaur attacks by sending a vine at an upward arc to attack opponents above it. The attack has a sweet spot at the end of the vine that deals more damage and knockback. This move also functions as a tether recovery. When used as such, Ivysaur hangs offstage for a short time before automatically grabbing the ledge, or when the player presses any button excluding down, which causes it to let go of the ledge. In Super Smash Bros. Ultimate, Vine Whip no longer causes helplessness, making it a more reliable recovery. 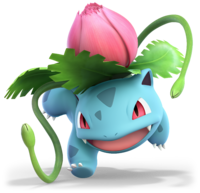 Ivysaur also uses the vines for several of its other attacks, including its grabs, its neutral attack, its side and down smash attacks, its side aerial, and for throwing Razor Leaf. Pokémon Change is the Pokémon Trainer's down special move shared across all three Pokémon. When used, Charizard takes Ivysaur's place. Pokémon Change comes out slowly, though it grants some invincibility frames, preventing Ivysaur from taking damage during the move. In Super Smash Bros. 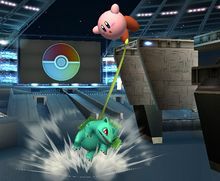 Ultimate, Pokémon Change no longer has invincibility frames, though it happens much quicker, and can be used in midair, allowing Ivysaur to be used quickly. Triple Finish is the Pokémon Trainer's Final Smash, in which all three Pokémon join in to attack. During the move, Ivysaur uses SolarBeam. "A Seed Pokémon that excels at attacks that cover it from above." GB Pokémon Red/Blue A Seed Pokémon that is the evolved form of Bulbasaur. It has a flower bulb on its back, the weight of which has made it develop strong legs and hips. If the blossom gets too big, the Pokémon can't stand on two legs alone. At a certain level, it evolves into Venusaur. When this happens, the bulb absorbs nutrients and blossoms into a large-petaled flower. GBA Pokémon FireRed & Pokémon LeafGreen (09/2004) Watching your starter Pokémon evolve is an unforgettable experience. For many trainers, that first happened when Bulbasaur became Ivysaur. It might be difficult to say good-bye to cute little Bulbasaur, but before they know it, they'll be saying bye to Ivysaur, too, as it turns into a fully grown Venusaur! Fushigisō Literally 不思議草, which mean "mysterious grass"; officially romanized Fushigisou. It is also a pun on 不思議そう, which means "(it seems) mysterious". French Herbizarre Pun of "herbe" (grass) and "bizarre". German Bisaknosp Pun of "bisamratte" (muskrat) and "knospe" (bulb). Portuguese (NOA) Ivyssauro A pun of the English name. Ssauro come from "dinossauro" (dinosaur). Isanghaepul Pun of "isanghada" (이상하다, strange) and "pul" (풀, grass). ↑ 1.0 1.1 Nintendo. (June 14, 2018). Super Smash Bros. Ultimate Gameplay Pt. 5 - Nintendo Treehouse: Live | E3 2018. YouTube. Retrieved July 2, 2018. This page was last edited on March 12, 2019, at 23:29.